In 44 days and 16 hours, I'm going to have students sitting in my classroom. Where has this summer gone? So far, it's been lots of training and conferences plus Vacation Bible School. And, I've still got a vacation to Colorado, church camp, and more training (including TWITTER MATH CAMP!) slated for the second half of summer! I read Carol Dweck's book, Mindset: The New Psychology of Success . That gave me a ton to think about! I want to re-examine how I start the year to see how I can include some lessons on mindset for my students. I think this has the potential of being a big game changer in my classroom! I've been enjoying this little bit of downtime, though. Sleeping in late. Afternoon naps. Mowing my lawn. Okay - that's not necessarily a fun thing. I tend to put it off until I start visualizing my neighbors giving me dirty looks when they drive by my house or look out their windows. I got a Fitbit a few weeks ago, so I do get a little more satisfaction out of mowing now - steps! Thanks to my ever-generous landlord, I got a chance to go and see Wicked last week! It was my first ever theatre experience, and I'm not sure any subsequent experiences will ever be able to live up to it. Kay called me at 3 pm to ask if I wanted to go see Wicked. It was her treat, and she would be picking me up at 4 pm. Short notice, but I didn't mind. I don't exactly have a happening social life... After agreeing to go, I had to do a quick google search to see exactly what I'd gotten myself into. Hmmm... A musical based off of the Wizard of Oz. Sounded interesting. Musicals aren't normally my favorite, but I'm willing to try anything once! Wicked - Look how close we were! After dinner at Olive Garden in Utica Square, we headed to downtown Tulsa to the Performing Arts Center. Another place I'd never been before. We waited outside for the doors to the theater to open, and we used this as an opportunity to do a little people watching. What I didn't know when Kay invited me was that she has season tickets to the Broadway shows that come to the PAC. Really, really, really good season tickets. We entered through the orchestra seating doors and kept walking down and down and down and down. Our seats were in the SECOND ROW. Dead center in front of the stage. I'm having trouble finding words to describe how phenomenal these seats were! Like I said, I'm not sure any experience will be able to top this one. From my seat, I could see the top of the conductor's head in the orchestra pit. When Elphaba would move her arms, I could see tiny wrinkles forming in her green body suit. When they shot out confetti, it landed in my lap. Yes, they were awesome seats. And, it was an amazing performance. I'm pretty sure I sat there with a grin on my face the entire time. I just couldn't stop smiling. Whenever I've watched a musical before on tv or dvd, I've tended to sort of tune out the songs. But, not this time! I loved watching the actors and actresses tell a story through the music. It was cool to watch a story that I know so well play out in a way that I never expected. I laughed a lot. I'm pretty sure I listened to the Wicked soundtrack in its entirety at least five times in the first two days following my first theatre experience! I've fallen in love with these songs in a way that I didn't think was possible. This one experience may have just made a musical lover out of me. So, that's just a little of what I've been up to. Expect less posts/no posts this week as I spend this week with my family. If you read my ramblings regularly, you know that I'm a reader. I love everything about reading. Books. New books. Old books. Fiction. Non-fiction. E-books. Physical books. Textbooks. Math books. Shopping for books. Shopping for more books. Rearranging my bookshelves. (I have four.) Attacking the page with highlighters, colored pens, and sticky notes close at hand. (I blame college for this habit. Before college, I thought it sacrilegious to mark in any book other than my bible. Ironic, right?) Those mixed feelings you get when finishing a book--when you're excited to be done but sad at the same time. The simple act of flipping through the pages in a book. Sharing favorite books with others. 2014 has been the year of reading. Today, I finished book number 66 of the year. It was a book given to me by one of my mentors during my senior year of college. I just got around to reading it today, two years after graduation. Better late than never. This weekend also saw the start of another book. This is a book I picked up several months ago at Mardel when it was on sale for $5. I've read such good things about it in the blogosphere. And, I have not been disappointed. The author writes about her journey to live a life that embraces grace, thanksgiving, and joy. Though life's circumstances are not always ideal, she starts writing a list. 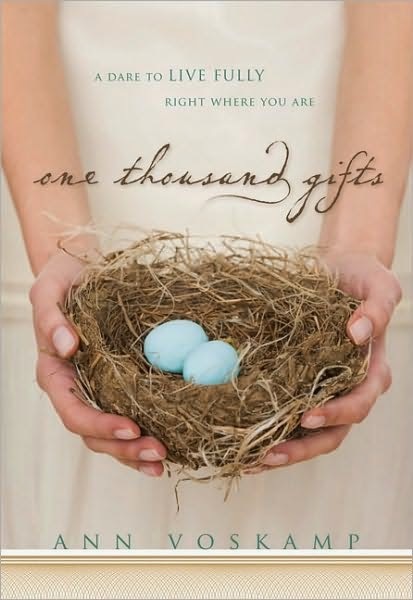 A list of one thousand gifts. One thousand things to be thankful for. One thousand things to praise God for. One thousand moments in time. Fleeting moments that should be savored. Moments that can too easily pass by without our noticing them. Moments we have to train ourselves to look for. I haven't finished the book yet, but I started writing my own list today. My own journey towards recording one thousand gifts. It has made me more mindful of the small things. More present in the moment. Washing dishes wasn't just another chore on my list of things to do today. It was an opportunity to count blessings. 1. The warm glow of the lamp, cascading over the back of the couch. 2. Spending the morning snuggled under my "couch blankie." 3. Colored pens, highlighters, and Bible study time. 4. A silent house punctuated only by the tick of the clock. 5. Birds chirping their little tunes outside my window. 6. The flicker of a candle on the kitchen counter. 8. Warm toast with butter and honey. 9. A vase holding a dandelion, plucked from my front yard. 10. A smile sparked by soap bubbles wafting through the air. 11. Twist ties stored in a tiny, Fiesta pitcher. 12. Drinking ice water from a mason jar. 13. Sun catchers hanging in my kitchen window. 14. The low hum of the hard-working air conditioner in the middle of summer. 15. A Saturday morning spent tickling the ivories and singing songs of praise to God. 16. Sandwiches cut into tiny triangles. 17. Pouring rain and lightning in the distance. It's probably too soon to say this, but I think this book and this list might be changing my life. I want to live a life of gratitude and thanksgiving. I want to notice the small moments, filled with blessings. I get so busy during the school year that I miss out on so much. I need to become intentional in my thanksgiving. And, joy unspeakable that won't go away will surely result. I need to carry this into my classroom. I need to record the tiny triumphs that happen every day. The types of things that can be easily overlooked. Advice: "If it's not about the students, just say NO!" The most valuable classroom time is the very beginning and very end of class. Sadly, these are also the most wasted times. Recommendation: Use Exit Tickets to maximize end of class. And, use Tickets In The Door to maximize the beginning of class. Tickets in the door were a new concept to me. Here's how they work: give students a short assignment that they must have the next day to enter your classroom. Students who have not completed the assignment cannot enter your classroom until it is completed. You can use a tool like Remind101 (now just named Remind) to remind students of their upcoming ticket in the door. "You have to be at least a little bit uncomfortable to be learning!" After a quick review of the unit circle, we got out our graphing calculators to work through another activity from the Balanced Assessment in Mathematics Project. The next activity we worked through was an example of how we could take something we were already doing in our classroom and raise the rigor of the activity. 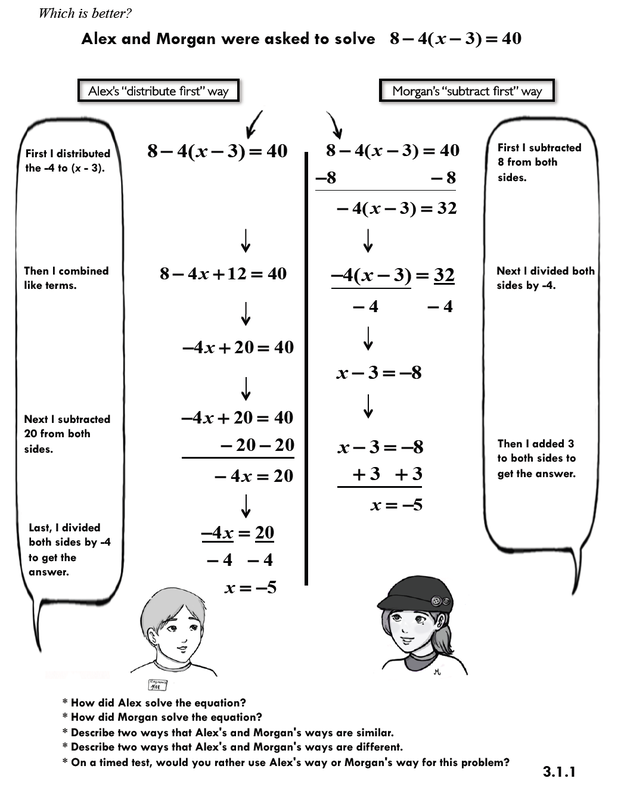 For example, we expect our Algebra 1 students to be able to rearrange literal equations to solve for any variable. A typical problem would read: "Solve the formula C = 2*pi*r for r." Not exactly exciting. To step these problems up a notch, we were asked to write the equation for the area of a circle as a function of its circumference. Or, write the equation for the area of a circle as a function of its diameter. Another: write an equation for the volume of a cube as a function of its surface area. As we sat and worked through these problems, we really had to think. Were these super hard questions? No. But, as teachers, we can get so used to always approaching something a certain way that it can take a minute to reorient yourself when a question is asked differently. We weren't just going through the motions and solving for a single variable. Instead, we had to look at both equations, see what they had in common, determine which equation to solve for that common variable, then plug the result into the other equation. There are tons of ideas out there on the Internet for data collection activities for linear, quadratic, and exponential functions. But what about rational functions? Those are rare! This activity comes from a collection of data collection activities for an introductory physics class. You can download the file here. The same publishing company that made this file available for free has some other files online that may be of interest. The activity begins by giving students this page of paragraphs to measure. Ask students: what is constant on this page? What is changing from paragraph to paragraph? Measure the width (x) and length (y) of each paragraph. Record your data in a table and create a scatter plot. Predict the mathematical model that would best represent this data. Find a regression equation that models this situation. Why is this appropriate? After working through some basic constructions, we moved on to an activity called I Really Gotta Go! We received a paper that had three points, labeled A-C, and these instructions: There are 3 playground areas in the park indicated by A, B, and C. The recreation department wants to place restroom facilities so the will be an equal distance from each playground. Show where the restroom facilities will be located. I had trouble with this activity. I bisected each side of the triangle, but I wasn't sure what to do afterwards. One of my tablemates was able to show me what to do next. Geometry really is one of my weak areas. I haven't really needed to do geometry since I took the class in the 9th grade! The last activity of the day was from NCTM Illuminations. It's called Too Hot To Handle. You can download all the resources for this activity here. Because we were running out of time, we had to slightly modify our data collection. We put the thermometer in the water, removed the thermometer, and recorded the temperature every 10 seconds. The actual activity calls for you to leave the thermometer in the water and record the temperature every 3 minutes. It was suggested that you could have your students research several of the questions from the worksheet packet before doing the project. They could even be a ticket in the door! For example, have students research "What temperature is considered scalding? or "At what temperature is it safe to take the first sip of coffee?" One of our homework problems was a task called Gligs and Crocs from the Balanced Assessment in Mathematics Project. You can download the file for this activity as well as an answer key from the Balanced Assessment website. This problem was a fun little challenge. My first attempt at working out this problem did not go well. But, I regrouped, tried a different approach, and succeeded. This is one of those problems that doesn't have a pretty answer. But, I should give my students more problems with messy answers. They shouldn't immediately think that they got something wrong just because they got a fraction/decimal. Ask Students: "What's your takeaway for the day?" If you're using technology to replace student thinking, that's inappropriate! If using technology encourages student thinking, that's appropriate! Technology doesn't have to plug in or have a battery. Here is the first of five posts wrapping up what I learned during the second and final year of the Oklahoma Geometry and Algebra Project (OGAP). First off, I want to thank the people who made this amazing experience possible. The workshop was coordinated by Dr. Jennifer Bryan from Oklahoma Christian University and Dr. Martha Parrott from Northeastern State University - Broken Arrow. The workshop was facilitated by Linda Hall and Martha Wissler. Linda and Martha are both retired math teachers from Edmond Public Schools, and they are phenomenal! I have learned SO much from them. Statements about what teachers should do in the classroom. Strategies that were at a lower-level on Bloom's Taxonomy were placed below strategies that were at a higher-level. Statements about what teachers should be doing in the classroom. Same ordering of thinking skills. And, statements about what math instruction in general should be like with the same structuring as above. I sadly didn't take a picture of the other groups' groupings, but they were vastly different from ours. It was interesting to see how differently the same set of statements could be grouped. It turns out that these statements were taken from Principles to Actions, a recent publication of NCTM. In Principles to Actions, these statements were sorted into two columns with the headers "Productive Beliefs" and "Unproductive Beliefs." As part of the workshop, we received a copy of Principles to Actions: Ensuring Mathematical Success for All . As one of our homework assignments, we had to read several sections of it. I've really enjoyed what I've read so far, and I'm looking forward to delving into it further. I may never get my Summer Reading List done now since I keep adding new books to read! One of the reasons I'm looking forward to reading it is that the chair of the writing team was Steve Leinwand, the author of Accessible Mathematics: Ten Instructional Shifts That Raise Student Achievement which I read and LOVED last month! You can see my review of that book here. This wasn't the only resource we received. Going to one of these workshops is kinda like Christmas! We each picked a subject to specialize in this year. Last year, I chose Algebra 1. This year, I decided to switch my focus to Algebra 2. Basically, we have to collect data from one of our classes. We give that class a pre-test and post-test as well as having them make concept maps at the beginning and end of the school year. The class we focus on is the class we will collect our data from. We received a new textbook from Big Ideas Math for the subject we chose to specialize in. I haven't had a ton of time to peruse the text yet, but the first thing I noticed was how much thinner the textbook was from a normal textbook. This line of books was written specifically for Common Core. I'm hoping I will be able to pull out some great problems to use with my students from this text! Probably the best resource we got during the week was a 3-inch binder packed with activities! Several of the activities we did during the week were from The Charles A. Dana Center. Last year, we received a cd of Algebra Formative Assessments Through The Common Core. This year, we received Geometry Formative Assessments Through The Common Core. Each cd has pdfs of 3-4 different books on it! We joked that the next book we received would be considered contraband in our schools now. Even though Oklahoma has pulled out of Common Core, I still found my reading in The Common Core Mathematics Standards: Transforming Practice Through Team Leadership to be relevant to my teaching practice. Whether we are teaching CCSS or not, shifts are happening. And, this book talks about what needs to happen to make these shifts possible. One resource we didn't use a lot of this week was our copy of the Common Core State Standards for Mathematics. Actually, I used it three times during the week. But, all three of those times involved me turning to the reference sheet to look up a formula! Next year, I am definitely going to make a reference sheet for my students to keep in their interactive notebooks! Now that you're jealous over all the awesome goodies I got, I'm going to share the resources we were given on Day 1. Enjoy! The first problem we worked on in our groups was the camel crossing the desert problem. I had just seen this problem the previous week in the copy of Discovering Advanced Algebra that I ordered off of Amazon. I remember reading the problem and thinking it sounded interesting, but I hadn't spent any time trying to solve it. Clipart from ClipArt ETC - one of the best sources for free clipart for the classroom! My group got right to work and figured out a way to transport 500 bananas across the desert on our first try. Linda looked at our solution and told us that we could do better than that. We tried, but ever subsequent strategy ended up transporting less than 500 bananas! One group was able to arrive at the solution during the 45 or so minutes we were given to work on the problem. The rest of us had to take the problem home for homework. At home, I tried to solve the problem by employing simpler cases. But, I never did make the breakthrough I needed. The next day, they provided us the solution. I kinda wish I had left the room during the explanation so I could have figured it out for myself. Oh well... There are plenty of other math problems out there for me to solve! Fawn Nguyen gives her students a version of this problem that involves transporting 45 watermelons across a 15 kilometer desert. I think this problem would be much more approachable for my students. Plus, you can easily represent 45 watermelons with manipulatives. I wouldn't want to try to represent 3000 bananas! I definitely want to work this problem into my curriculum next year! Next, we moved to an around the room scavenger hunt style activity from Howard County Public Schools. If you're still in a Common Core inclined state, the alignment is F.LE.A.1. 10 graphs were hung around the classroom. As you can tell, some of the graphs are linear, and some are exponential. We were given pages with 10 equations, lettered A-J, 10 tables, lettered A-J, and 10 verbal models, lettered A-J. The facilitator assigned each group the letter of the graph they would start on. Now, I've done scavenger hunt style activities in my classroom, but I've never done one quite like this before. A timer was set for 2 minutes, and we had to stay at the graph we had been assigned for those 2 minutes. On our answer sheet, we had to record the letter of the table, equation, and verbal model that matched up with the graph we were standing in front of. When the timer went off, we had to move as a group whether we were ready or not. As we became more accustomed to the activity, the time we were given at each station was decreased to 1 minute. Some of the groups HATED that everything we were matching was labeled with the same sets of letters. So often, someone in my group would say something like, "This has to match H!" Another person would look at them like they were crazy. "It can't be H!" It would then turn out that one person was talking about the table and the other was talking about the equation! We had to attend to precision with our speaking during this activity. Since I have such a small classroom, the student groups would be very close together if I was doing this activity with them. By reusing the same letters, students can't just listen to the group ahead of them and record their answers. "Okay guys. Our next answer is going to be B." Was it B on the equations, tables, or verbal models??? I've never timed my groups before during this type of activity, but I think I'm going to try that this year. In the past, I've let groups move at their own pace, and that means some groups whiz through the activity and other groups do nothing all hour. Hopefully this will help both of those problems! You can download the files for this scavenger hunt activity here. You will need to scroll down to where it says "HCPSS UDL Lesson: Comparing Linear and Exponential Functions." * Build relationships with students so there is trust! * Get the math out of the textbook, and put it into the lives of students! * Turn mistakes into learning opportunities. * Use individual white boards to increase students' willingness to attempt a problem. I've found that my students are more willing to try a problem if they can easily erase it if they mess up. * Say to students: "Explain to me how you got here." * Go back to see what your students are actually struggling with. If they are having trouble simplifying radicals, go back to multiplication. Can they fill out a multiplication chart? Start here. * Color code the steps of your math problem. Allows students to ask safe questions. "How did you get the blue part?" A student who struggles with math vocabulary would be more willing to ask this question as opposed to trying to ask a question using vocab he doesn't know and sound foolish. * Class time needs to consist of comparing and discussing MULTIPLE solution methods. * Ask / Expect students to EYB - Explain Your Brain. The next activity we worked through was a rotating station activity. There were three stations set up around the room. At each station, we were presented with two different ways of working a problem. And, we were asked specific questions about the different solution methods. - Why does it work? This was an example of asking the question "Which is better?" Is anyone else excited about this? You're going to be especially excited when I tell you that there is an entire Algebra 1 curriculum of these that you can download for FREE! These are from a project entitled Using Contrasting Examples to Support Procedural Flexibility and Conceptual Understanding in Mathematics by researchers from Harvard, Vanderbilt, and Temple University. Here's a direct link to where you can download these curriculum materials as PDFs. But, I'd suggest taking a look around the rest of their site, too! This study showed that student achievement improved when students were routinely presented with multiple ways to solve a problem. As teachers, we can have a tendency to show our lowest students only a single way of doing a problem for fear that we will overwhelm them with multiple methods. But, our students need to realize that there are many different and correct ways to solve a problem. If we're not showing them this, we're cheating them! I'm excited to look through their curriculum more closely and see what I can use this year! If you find any awesome resources, send them my way! As one of our facilitators said, "When students are analyzing, they are thinking!" Another quote I jotted down in my notebook: "Make students into thinkers - not a location for dumping information." Ahhh! The dreaded mixture problem! Bonnie and Carmen are lab partners. They need a certain mixture of X% acid and Y% water. But, they only have access to a mixture of A% acid / B% water and C% Acid / D% Water. Whatever can they do? The specific problem we worked is under copyright by the Dana Center, so I can't post it here. But, I can tell you about how we approached this problem during the workshop. Since we needed 5 ounces in our example problem, we first tried out 1 ounce of Mixture A and 1 ounce of Mixture B. We used percents and multiplication to find the new amount of acid and water. Then, we divided by the total number of ounces to calculate the percentages of acid and water in the new mixture. In the last column, we had to decide if we had too much acid or too much water and adjust accordingly. In our example, we ended up with too much water, so we tried a different break-up of the 5 required ounces. We repeated and repeated and repeated the process. Eventually, we discovered that 4 ounces of Mixture A gave us too much water in our final mixture. 5 ounces of Mixture A gave us too much acid in our final mixture. Therefore, we needed somewhere between 4 and 5 ounces of Mixture A, and we went from there. It was a ton of work to work the problem out this way, but I think it would really help students to see how the process works. I've never actually done mixture problems with my students before. They're not tested, so I've always conveniently skipped over them. The presenter said that she used to teach her students how to set up the system of equations, but they never really understood where the numbers in the equations were coming from. You definitely wouldn't work every mixture problem out this way. That would be insane! But, doing the process once should help students visualize the process and better understand why a system of equations can be used. I can also see myself using this as a quick review of percents/proportions/decimals/etc. Then, revisit the problem when you get to systems. The last problem of Day 1 was Casey's Quesadillas from The Dana Center's series of Geometry Formative Assessments. Casey has a map of downtown. He draws a circle on the map of where he would like to advertise his food truck. Rewrite the equation of his circle in vertex form. Decide where Casey should place his quesadilla cart. It then proceeds to review the meaning of radius and the distance formula. I can see myself using this activity in Algebra 2 during our unit on conic sections. It reminds me of Dan Meyer's Taco Cart. Our homework assignment included completing a series of Short Tasks from MARS (Page 2 of this pdf.) This was easy and straight forward. Then, we were to complete a task from the Balanced Assessment in Mathematics Project called Three Circles. This one took a bit of thinking! At first, I was sure that they hadn't given us enough information. But, I was soon able to set up a system of equations and solve for the radii. Great problem! You can download this task from the Balanced Assessment Program here. Overwhelmed yet? This is just Day 1 of an AMAZING workshop! I spent all last week at a Common Core workshop for teaching Algebra 1, Algebra 2, and Geometry. If you're not from Oklahoma or you don't keep up with education news, you might not realize the irony of the previous statement. At the beginning of this month, Governor Fallin signed HB 3399 which repealed Common Core in the state of Oklahoma. Instead, we are going to revert to our old standards for two years while we write out own new set of standards which will be more rigorous than Common Core. I'm scared to even think about what those will look like. When I entered the teaching profession, I knew next to nothing about Common Core. My professors in college told us that it was on the horizon, but they did nothing to prepare us for the upcoming change. They assured us that our school districts would have a transition plan and provide training. Ha. Ha. Ha. I ended up accepting a position working in a school district whose Common Core transition plan involved hanging posters of the standards on the walls and saying we had transitioned. Meanwhile, I had coworkers who had never even heard of Common Core. When you mention Common Core to a math teacher and get a blank stare in return, that's not a good sign. The English teachers in my district assured the administration that there was no difference between Common Core and what they were already teaching. I was regularly told that no action or changes on my part were required. After all, Common Core wouldn't be around for long. We didn't really need to worry. I guess they were right in this case... But, won't they just say the same thing about the next set of standards? Will my district ever embrace change? Meanwhile, I am looking at the CCSS Math Standards, and I am overwhelmed. The topics I am teaching my Algebra 1 students will soon be 7th and 8th grade standards. The topics I am teaching my Algebra 2 students will soon be Algebra 1 standards. Some of the standards ask my students to prove things that I don't even know how to prove off the top of my head. With no support from my district, I sought out my own Common Core training. I listened to webinars. I read blog post after blog post. And, when I heard about a week-long training program through the Oklahoma Geometry and Algebra Project, I jumped at the chance to attend. Since I teach in a low-performing district, I knew that the transition was going to be rough. Our high school offers no math remediation classes. So, I have to fit that remediation in during the school year or my students won't have access to it. This slows me down and means that I can't cover as much curriculum as I would like. If a student is struggling in Algebra 1, there is no other place for him or her to go. There is no Algebra Concepts class or extra support class. It's a sink-or-swim environment. I will openly admit that I teach to the test. If a topic isn't tested, there's a 95% chance that I don't teach it. I just don't have enough time. If I had a room full of students on Day 1 who could add, subtract, multiply, and divide positive and negative numbers, I would be in heaven. There is no Pre-Algebra class to send them back to to learn this. If my students can't work with integers, it's my job to teach them that. So, yeah, my Algebra 1 students are the students that Geometry teachers complain about because they enter their classroom having never used the distance formula or the quadratic formula. Sorry, but it's not on my test. And, if you are going to tell me that my students can't graduate without passing the Algebra 1 EOI, I'm going to do my best to make them pass the test. I owe that to my students. When I talk to teachers in larger, more urban districts I get jealous. If a student isn't successful during the first semester of Algebra 1, they are pulled out and placed in a support class for the rest of the year. This student is then not required to take the end-of-instruction exam, and the school's report card will not be affected. Teaching in a small district, we do not have this luxury. I see technology and resources that they are able to provide their students that we just can't afford. I teach in the type of district that has been re-buying the same textbooks since 2004 so they don't have to throw away the old copies. If you looked at my school's report card you would see a C-. As someone who has made a grand total of 1 B in her life, a C- is hard to stomach. Average the three schools in my district together, and the state of Oklahoma deems us a D district. As hard as I knew it was going to be, I was ready and up for the challenge for teaching Common Core. I was ready to raise my expectations and push my students to their limits. After working for the past two years to prepare to transition to Common Core, I feel like I've been slapped in the face by the state legislature. With one bill, they've thrown out countless hours of hard work by teachers. And, that doesn't even begin to mention the amount of money the state spent on the transition. In a way, I was dreading this week of Common Core Training. I thought it would be 5 days of complaining about the repeal. But, our facilitators reminded us that good mathematics teaching is good teaching whether we call it Common Core or not. Since the workshop was grant-funded, the workshop had to continue to focus on Common Core since that was what the grant stipulated. Common Core was helping to move me away from teaching the way I was taught. Just because our standards are going backwards, it doesn't mean that the way I teach has to. I can (and should!) still provide my students with questions and problems that promote higher-level thinking and perseverance. We can still attend to precision and choose appropriate tools to solve problems. Higher expectations don't have to die with the repeal of Common Core. It was amazing to get together with other teachers and look towards the future. The overall attitude of the conference was upbeat and positive - something I definitely needed! This week, I hope to get my notes from each day typed up. It's a way for me to reflect on what I learned. It's a way for me to share resources with others who are looking to improve their teaching of math. And, it's a way for me to be able to search back through my notes - something I can't do if they're stuck in a notebook or binder. In the meantime, if you're hungry for resources, feel free to look through the resources I posted from last year's week-long workshop. I set down today to write a post about an awesome geometry activity I got to experience last week at a workshop. However, I'm afraid you're going to have to read about my unfortunate experience with a mouse in my house first. It's a rainy Monday. After living out of a suitcase for 22 of the past 28 days, I'm enjoying this day at home with only one thing on my agenda: Friends of the Library Board Meeting. How I spend the rest of the day is entirely up to me! So far, I've spent my morning doing endless loads of laundry, rearranging my bookshelves, reading a bit here and there, and working on deep-cleaning my house, one room at a time. Other people spring clean. Not me. Let's be honest; teachers don't have time for spring cleaning. I spend my spring stressing over standardized test prep and the million and one activities that are going on at school. So, what's the occasion for my cleaning? It's called "Oh my goodness. A mouse has been in my house cleaning." In six years of living on my own, I've never had to deal with a mouse before. Let's just say I'm not handling it all that well. You might even go as far as to say that I'm over-reacting. What exactly is the proper first step to take up discovering a mouse has taken up residence in your house? I'm going to bet it's not the text I sent my mom or the phone call I made to my sister. To my mom: "I think it's time for me to move and find a new place to live. I just saw a mouse in my house!" I mean, either way, somebody has to leave. It's either the mouse or me. Though moving is on my top ten worst things in the world list, it may or may not have just moved down a spot. Of course, my mom was full of sympathy. She responded, "It could be worse. You could have a bear in your house." Thanks, Mom. That's really helpful. I guess I do have to give her credit for buying me one of those mouse traps that doesn't require you to touch the mouse when you dispose of him. It's currently setting in the floor of my bedroom. I'm starting to think that my little mouse friend isn't attracted to the all-natural, preservative-free peanut butter I keep in my fridge. Enough about the mouse. Let's talk about archaeology. I spent 5 glorious days last week at NSU-BA as part of the Oklahoma Geometry and Algebra Project (OGAP). So much fun! So much learning! On the first day of the workshop, I walked in the room, and my eyes were immediately drawn to the table along the wall that held the supplies we would be using for the week. There were thermometers, bags of play sand, work gloves, protractors, compasses, rulers, and SO MUCH CANDY. I was incredibly curious about how play sand was going to find its way into a math lesson. Monday passed, and the play sand remained on the table. Tuesday came and went without any activities involving sand. Surely we would get to play with the sand on Wednesday! Nope. Finally, on Thursday, we entered the classroom to see that a metal bucket had been filled with the sand. I doubt you know this (unless of course you're my sister - Hi sis! ), but I've always thought it would be so much fun to be an archaeologist. I was that kid who used to wish for a metal detector. Okay, I still wish I owned a metal detector. My parents never did give into that request. I'm pretty sure my mom didn't want the yard full of holes. I just think it would be so exhilarating to unearth ancient artifacts! But, I would not make a good archaeologist. I'd probably get fired for complaining too much. You see, I don't handle dirt well. I don't like getting dirty. So, having a job that involves digging in the dirt probably wouldn't be the best fit. Plus, I hate, hate, hate hot weather. Oklahoma summers can be awful, and the air conditioner is my best friend. Since I doubt I'll ever get a chance to pursue archaeology, I was excited to get to try my hand at an archaeology dig during the workshop. The workshop facilitators urged us to use caution in this activity to avoid injury. One person per pair was instructed to come to the bucket, don a pair of work gloves, and use the Mickey Mouse/Cars trowels to unearth an ancient artifact to carry back to their desk and trace. I actually let my partner do the digging so I could document the process with my camera. After digging in the sand, my partner unearthed a shard of pottery. It looked like it was once part of a plate. Our task was to calculate how big the original plate was that our shard belonged to. Then, we were to compare the measurement we found to the other groups in the hope that some of our shards might fit together to form a more complete artifact. Our first step was to trace our artifact on plain copy paper. This was a little tricky. And sandy. I didn't actually remember to take a picture of our artifact. But, here's the artifact of the other group sitting at our table. Once we had our artifact traced, we had to decide on a strategy. How could we figure out how large the original plate was? Our first instinct was to measure the arc length. That wasn't much help. We had been assured that the plates were not broken in the center. So, how could we find the actual center? This wasn't the first time I had had this dilemma. On Monday, we had to take a pre-test. I usually do quite well on these types of things, but this test had several problems that stumped me. On the test, there was a drawing of a piece of the top of a broken glass coffee table. Given this piece of the broken table, instruct your friend what size of circular glass table top he needs to purchase. After measuring the two sides and finding them to be different lengths, I was stumped. Here I was again. Same problem. Different context. Still stumped. I guess my table looked lost/confused/dazed because one of the facilitators came over to give us a little shove in the right direction. She told us that we needed to draw two chords. My geometry is a bit rusty, but I can still draw chords. Now what? Thankfully one of the others at my table had taught geometry recently and remembered that the perpendicular bisector of a chord always goes through the center of the circle. Once we found the perpendicular bisector of each chord, all we had to do was find where the bisectors intersected. Then, it was just a matter of measuring the radius! And, yes, I did label my paper "Artifact A." I'm cool like that. How fun is this activity?!? It kinda even makes me want to teach geometry. This was, by far, one of my favorite activities from the 5-day workshop. I've always thought constructions were kinda cool, but I've never seen them as useful before this activity. After completing the project, we had a discussion on how to adapt this for our own classroom. We decided that maybe using an actual broken plate wasn't the best idea. A kid could easily get hurt. One teacher suggested cutting up Chinet plates for the activity. Another said that you could break the plate and just hand out the tracings. Keep the artifact in a ziplock bag so the kids could see it but not touch it. * Each pair of students should dig for a piece of the artifact. * Trace the shape of the artifact on paper. * Using any manipulatives or tools in the classroom, find the radius of your object. * Find the other groups that have the same measurement and fit the pieces together to form the original artifact as best as you can. Have you ever done anything like this in your classroom? Can you see yourself using this activity? Please share! I'll also accept your commiserations regarding my new (and hopefully very temporary) house guest. I need a pause button on my summer or something. These past few weeks have been BUSY! Vacation Bible School. Tulsa Math Teachers' Circle Summer Immersion Workshop. Presenting at the OCTM Summer Conference. The MTC Training was incredible. I had so much fun, and I did so much math! I've always thought that I when I pursue a master's degree it will be in education. But, spending 3 days doing math alongside mathematicians has made me start thinking about maybe pursuing a master's degree in pure or applied mathematics. Will I actually pursue this? I have no clue. Just last week, I told somebody that I couldn't see myself leaving the secondary classroom anytime soon. When I graduated from college two years ago, I was done with college. I was ready to be the teacher giving the homework instead of the student doing the homework. At The University of Tulsa, I had the amazing opportunity to complete separate degree programs in Pure Mathematics through the College of Engineering and Natural Sciences and Secondary Education through the College of Arts and Sciences. I never quite fell in love with the process of writing proofs, but I think that experience helped deepen my love and appreciation for the subject. Fast-forward two years. During the MTC training, I remember thinking how much I wished I had been able to take a class in Number Theory as an undergrad. This past weekend, I went in search of a free online number theory book. And, then I proceeded to start completing the exercises in order. The first sets of exercises is a set of proofs by induction. As I started working through these, I realized just how much fun they were. I didn't think I would ever refer to proofs and fun in the same sentence. I'll try to write a more reflective post on my MTC experience, but for now I will say that it was a refreshing (and exhausting!) experience to spend 2+ hours on a single math problem. This week, I'm at OGAP which is an entirely different experience. It's 5 days of sharing best teaching practices and working through algebra and geometry activities. And, it's this type of workshop that makes me think that I'd love to teach future math teachers some day. Be a teacher of teachers. This would mean pursuing graduate studies in education instead of math. Be on the lookout for lots of reflection posts soon! I'm currently on workshop overload. 4 days of workshops last week. 5 days this week. I keep learning more and more stuff, but I can't seem to find the time to reflect here on all that I'm learning. I'll have to make that my goal for next week. So, this week, I'm at OGAP - the Oklahoma Geometry and Algebra Project which is being hosted at Northeastern State University - Broken Arrow. Yesterday at lunch, I was telling some of the other workshop participants about an idea from druinok who blogs at Teaching Statistics. When students are working in groups, she gives them 3 cups to keep in a stack on their desk. One red cup. One yellow cup. One green cup. You know, just like a traffic light. I picked up my cups at Party City for $2.99/package. I could have probably looked around and found them on sale, but I wanted to make sure I bought them before I forgot. This has only been on my list of things to buy and try out for MONTHS! If students are working and everything is going well, the green cup should be on top. If students have a question but can continue working, the yellow cup should be on top. If students have reached a point where they cannot move on without help, the red cup should be on top. Is it ironic that I'm using a traffic light strategy with my students who live in a town that doesn't even have a traffic light? I'm excited about trying out this strategy in my classroom for multiple reasons. When students are working in groups, I sometimes have difficulty figuring out where I am needed most. If one group has a red cup up, I need to be there. If all of the groups have their red cups up, that means we need to pause the group work and come back together as a class. I obviously need to clarify the problem or reteach a certain concept. Plus, it forces my students to think about their own levels of understanding. They have to ask themselves, "Okay. We're having trouble. Can we still keep working? Or are we completely against a brick wall?" You can read about druinok's experience with trying this out in her own classroom here. I'm going to combine this strategy with some of the strategies and group work norms that I've learned about from reading Strength in Numbers: Collaborative Learning in Secondary Mathematics by Ilana Horn. The author emphasizes that groups need to make sure they have discussed their questions in their groups before asking them of the teacher. It needs to be a group question - not an individual question. So, when a group puts up a red cup, I need to make sure that the group agrees on the question before I even consider answering it. One way I can do this is by choosing which student in the group to ask for the question. I shouldn't just ask the student who has their hand up. Though, I guess if groups have the cups, they won't have their hands up. This should help keep groups from distracting one another, right? Actually, I'm thinking of doing away with hand-raising all together in my classroom. I want to move to a popsicle stick strategy for calling on students. I have a tendency to just call on the same few students. These are the students who are engaged and want to participate. But, I need to be holding all of my students accountable for the information. Lots and lots of changes in store for next year! I'm hoping that year three of teaching will be the best yet! Summertime means sleeping in (sometimes), attending workshops and conferences galore, my church's annual turtle race to celebrate the end of VBS, and mowing the lawn. It also means looking through ideas to implement during the next school year. I love leaving a workshop or conference with a binder full of great ideas. But, when in need of inspiration, I usually turn to the Internet for help - not my shelf of giant binders. This summer, one of my goals is to get organized. And, one way I can do that is to type up my conference notes. Then, I can use my blog's lovely search feature when I'm looking for something! Smart, right? Plus, these resources might also inspire one of my readers. Double win! As I prepare to attend my second summer of the Oklahoma Geometry and Algebra Project (OGAP), I'm revisiting my notes from last summer's conference. Enjoy! We should strive to have students build, model, and reflect instead of memorize and regurgitate. * Make sure everybody in the group has a specific job. * Give each group only one copy of the question - encourages cooperative work! * Gather 10ish review problems you would like your students to complete. * Place each review problem in a paper/plastic cup. * Around Easter time, you could place each problem in an easter egg! * Assign each person in the group a job. - Question Seeker - Leads dialogue by asking, "Does this make sense?" or "How do we know" or "Why?" * Traveler goes to front of room and selects a cup. * Group works together to solve that problem. All students must agree on answer. All students must show work on their own recording sheet. * Can change group roles halfway through the activity. * Ideal to have most groups finish 7-8 problems. * Perfect semester test or standardized test review. * Give every student a full copy of every question and every answer at completion of activity. Blogged about this activity here. If your students are struggling with solving equations, introduce them to the do/undo method. This method is especially great for solving literal equations. Aligns to A-REI.3 and A-REI.1. Tie in with wrapping a present analogy. Actually wrap a present in front of the class. See a foldable I made for this method here. With 8th Grade Common Core Geometry, this may be an Algebra 1 level problem. Give students a page with 26 boxes to show work in. My tablemates had a blast with this problem during the conference! Common Core requires Algebra 1 students to be very comfortable with finding/interpreting the discriminant! Fruit Loop Catapult - Can't find link to activity. Sorry! Our kids need to stop thinking like the book has taught them to think. #1 should not be the easiest. #25 should not be the hardest. Give each group a large piece of graph paper! Don't put origin at bottom of graph. The Constant Chair - Can't find activity online. Sorry! Give each group 50 dice. Students roll dice. Remove all 5s. Record remaining number of dice. Roll dice again. Remove all 5s. Record. Roll, Remove, Record. Continue until you run out of dice. have students identify the domain and range of their data. Sketch a scatterplot. Determine what type of regression would be appropriate. Find the regression equation. What does the y-intercept of this equation mean in the context of the problem? I really wanted to do this activity this year with my Algebra 2 students, but we ran out of time! PISA Released Items - Great source of Common Core style questions! M159 Speed of a Racing Car would make a great bellwork problem! We added several other questions to this activity. I did this problem with my Algebra 2 students this year, and they struggled with it majorly! I gave it as a homework assignment that most did not turn in. The students who came to me for one-on-one help were able to grasp the activity, but few came to me for help. Not the answer you would expect! If I taught geometry, I'd definitely use this problem! Refer to "Rate of Change" not "Slope"
Extension - graph everybody in your group's car. If you're visiting my blog after attending my OCTM presentation on interactive notebooks, welcome! I'm so excited to have you here in my little corner of the world wide web. (Does anybody even call it that anymore??? Oh well...) If you just happened upon this site, you're also welcome. Pull up a seat. And, if you're one of my regular readers, let me just say thanks! If you didn't read, I'd probably still blog. But, you make the blogging process so much more fun! We're going to talk about something today that is very near and dear to my heart: interactive notebooks! I've used interactive notebooks in my Algebra 1 and Algebra 2 classes for the past two years. In fact, I can't imagine teaching without them! At the beginning of my presentation, I took a couple of moments to introduce myself. I asked my participants this question: If you asked your students to describe the note-taking that happens in your math classroom, what would they say? Then, I shared with them how my students described note-taking in their letters of advice to students taking the class next year. You can read more of the advice they gave as part of that assignment here and here. I tried to add color to make their specific statements stand out more. These quotes are word-for-word excerpts from the letters that they wrote. Probably my favorite comment is that they take "lots of meaningful, colorful notes." I like that they used the word "colorful," but the fact that they described them as "meaningful" makes me want to jump up and down with excitement. Of course, the feedback isn't 100% positive. And, it never will be. One of my students noted that the notebooks get "annoying sometimes." I don't think that's necessarily a bad thing. My students spend a large portion of their time annoyed at me. Why can't we have a free day? Why do you make us do so much work? Nobody else is teaching today. Why are you? Yeah, I'm okay with "annoyed." I tell them that I do it because I love them, and it's true. There are a ton of benefits to using interactive notebooks. These are just a few of the benefits I've found in my own classroom. One of the wonderful things about interactive notebooks is that they can be whatever you want them to be. My students don't have textbooks, so we are creating our own textbook as we go throughout the year. My students use them for notes only. But, other teachers have students store their homework and bellwork in their notebooks as well. If you open one of my notebooks, you will find foldables and graphic organizers galore. That's my teaching style and one of my strengths. If foldables just aren't your thing, don't do them. That's your choice. Your notebook should reflect your personality and teaching style. Many teachers make a differentiation between left hand and right hand pages. Right hand pages are teacher directed. They are the notes typically found in a math class. Left hand pages are student directed. The students have to find some way to process the information provided by the teacher and to create some sort of visual display that demonstrates their understanding. This could mean creating an illustration of a concept, writing and solving your own problem, writing a song about the topic, drawing a comic strip about the topic, writing a letter to a friend describing the steps to solving a specific type of problem, choosing 3 homework problems and writing out detailed solutions, etc. The possibilities are endless. I originally intended to use the left-hand/right-hand distinction, but it just hasn't worked for me. I guess I just have a need for control or something. I have to dictate to my students exactly what needs to go on each page of their notebooks. I still give them a certain degree of choice with some pages, but not the same extent of choice that is given by other teachers. It's completely up to you how much choice you allow your students! After this brief introduction to interactive notebooks, we jumped into looking at lots and lots of pictures of interactive notebook pages I have made in the past. I've made a bunch, so it was so hard to choose what pages and ideas I wanted to highlight. If you browse around my blog for long enough, you will eventually find all of the interactive notebook pages I have created. I recently created a Pinterest page that features pictures of every single interactive notebook page I have made + links to the page it is found on. You can click on the picture to visit that page to download the file for that page or to read more. My best suggestion is to follow the pinterest link above and just spend time browsing. There are currently over 280 pictures to look at. And, that's just the tip of the ice berg. You'll see some pages that you could use without modifications with your students. And, you'll see some pages that you would never use. Many of these foldables can be easily modified to cover any number of topics, though. There's also a tab at the top of this page that will lead you to a page of foldables, templates, and graphic organizers that I have created. I haven't updated this page with notebook pages from the 2013-2014 school year, so I'm a bit behind. They're on my blog and on the pinterest page, I just haven't added them to the tab at the top. I'm getting to the point where I have made so many pages and activities that they are hard to organize! I'm so excited to hear that you want to try out interactive notebooks next year! The process can be a tad overwhelming! Here's my advice for getting started. 1. Decide what type of notebook to use. I prefer composition notebooks. Spiral notebooks work great for a semester, but they just won't hold up for the entire school year. Others use binders or even graph paper notebooks. All have their pros and cons, of course. 2. Decide what you want your students to keep in their notebooks. Just notes? Homework? Bellwork? If students are just keeping notes in their notebooks, where will the other stuff go? This is one benefit of using a binder. You could have a divider for notes and other dividers for homework, tests, etc. I have my students only keep their notes in their notebooks. We don't have textbooks, so we are essentially creating our own textbooks. Students learn pretty quickly that if we put it in our notebook, it must be important! Next year, I'm going to have my students make homework/test portfolios in addition to their notebooks. 3. How will you grade notebooks? Completion? Rubric? Some people actually don't grade their notebooks. At my school, if I don't grade something, my students don't do it. I've moved to to a 0 or 100 grading scale for notebooks. If it's not perfect, students get a 0 and are required to redo the missing/incorrect pages in order to earn that perfect score. Students take much more care with their notebooks now! 4. Figure out what your first unit of the year will be. Do a search on pinterest for that topic followed by "foldable" or "graphic organizer." Get an old, partially-used notebook. Try to design notebook pages based on ideas you see online or from your own imagination. Play around with it. Have fun! This is the best way to see what works and what doesn't. I started out by making rough sketches of my pages, and that was the most helpful thing I could have ever done. 5. Have fun! Your first year (or second year or third year or - I think you get the picture!) of notebooking won't be perfect. You'll continue to learn better ways to explain things and improve your notes/foldables/graphic organizers. Realize that some days your notes will be boring. That's okay. If you want even more interactive notebook inspiration, I would recommend checking out the following sites of other teachers who use interactive notebooks in their classrooms. I have stolen so many ideas from them! My Sister Knows Me Well!